“You can’t know what it is like for us now – you will always be one step behind. You can’t know what it was like for us then – you will always be one step ahead. Harry and Craig were a couple. They are not anymore but they remain friends. That is why one summers day they decide to take on the world in the only way they can think of; by showing love. They start off on the lawn in front of the school with their friends and Harry’s family. They are hoping to set the world record for the longest kiss. During the next 32 hours they will be met with pain, ridicule, support and suffering but they don’t care, they need to focus on each other. Within that same 32 hours we meet Peter and Neil, who are a couple. Their kisses are different. Avert and Ryan get to know one another and share their first kiss, and Cooper partakes in virtual kisses as he starts to feel more alone than ever. As the kissing marathon continues these boys’ will evaluate life, their families and everything they thought they knew about love. I’m going to be completely honest with you about Two Boys Kissing; when I first started it I didn’t like it. I didn’t like the way it jumped around characters, I didn’t like the odd narration style and I didn’t think I’d connect with it at all. I put it down after 20 pages thinking I wouldn’t pick it up again. Then I was talking to a couple of other bookish types about it and one of them in particular told me I needed to go back, pick it up again and stick with it. Now I have I’m so glad I did! The story did chop and change between characters but it made sense. What was going on with some of them impacted others, even though they didn’t know each other and I really loved that. What Craig and Harry were doing was beautiful and heartbreaking, to know what each of them were thinking and going through because of it was incredible and I really hope that after the long sit down they will have needed at the end of the book they chatted and remained friends. The stuff with Ryan and Avery showed just how much you can mess up one special thing with anger and not realising how special it is. Cooper showed another side of anger and oh my, his story nearly broke me completely. And Neil and Peter’s relationship had to have the most serious, logical way of thinking that I have ever seen in YA fiction. They both knew that nothing lasts forever, they were under no illusion that they would see out the rest of theirs lives as a couple but they were willing to carry on and enjoy the present as it is. The writing style and the narration that bothered me so much at the beginning of the book became on of the things that I loved the most. Told in a collective invisible voice it was meant to be narrated from the men who died during the AIDS epidemic in the US in the 80’s. It was heartbreaking to think about those people and how being gay effected them so much and the bits with the history teacher were just brilliant coming from their point of view. It really made me think about how different it was for gay people in the 80’s and how just in my lifetime so much has changed. It still has so far to go but the hope is there. The final couple of pages of this book really did give me hope and they were beautiful. I couldn’t recommend this book enough and if you haven’t read it do. If you start and like me think its not going to work, push through. It is worth it and it is brilliant. I need more works of fiction like this more like this need to be fully accessible to teens in libraries and schools. 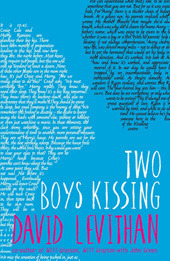 Two Boys Kissing was published on March 27th by Electric Monkey. My copy was sent from the publisher in exchange for an honest review.